Arsenal star Alex Oxalade-Chamerlain return to training Arsenal star Alex Oxalade-Chamerlain has returned to training after successfully recovering from his hamstring injury. Arsenal star Alex Oxalade-Chamerlain has returned to training after successfully recovering from his hamstring injury. Chamerlain picked up the injury in the last week of October when the Gunners faced Sheffield Wednesday in a Capital One Cup. Read Full Story: Arsenal trio set to return! The Englishman has recently posted a video on his Facebook page that he has returned to training and would be a part of the Gunner’s next game which will be played next week against West Brom. See the short training video below! While on the other hand, star attacker Alexis Sanchez is likely to be rested for the next few games. The reports from yesterday revealed that the Chilean has not taken a break from football and now is set to recharge his batteries. He has been playing football continuously, he was part of Copa America in the summer. 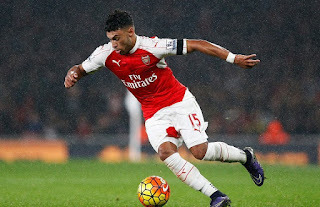 With the return of Chamberlain it also makes clears that now Arsene Wenger can give Sanchez a break. Read Full Story: Alexis Sanchez set to take a break! Also, Aaron Ramsey and Hector Bellerin are set to return to action from their respective injuries. Meanwhile, Tomas Rosicky, Theo Walcott, Danny Welbeck and Jack Wilshere continues to recover on the sideline. yeah sanchez needs atleast a game rest.